Remembering my childhood home isn’t so difficult for me. I lived there up until three years ago with my Dad whose health was failing. But, the home of my childhood was far different that the one that my Dad died in. 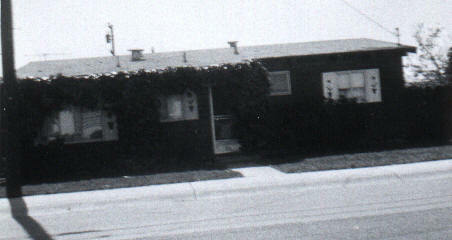 The house was part of one of the new housing tracts built in the San Francisco Bay Area in the late 1950s. There was a formula, but each house was slightly different giving it character that many tract homes lack today. The house was barn yard red with white shutters. All that fuzzy stuff you see is ivy. There were three posts in the front on the porch. The ivy covered the ground and ran up and down all those pillars. That is until my Mom learned that mice could live in ivy. Then, it all got pulled out. The garage was detached giving us a much longer front and back yard than the other houses on the block. The house itself was small. Well, small for 7 people. It had 3 bedrooms, 1 bathroom, a kitchen with attached dining area, and a living room. Our washer was in the kitchen right across from the counter. 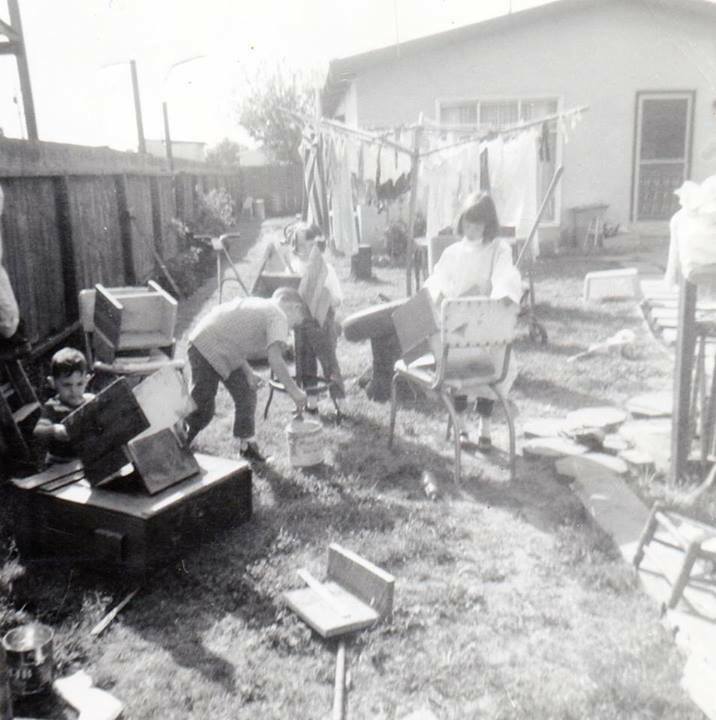 I can remember how my brother’s chair was between the counter and the washer–maybe a foot away. Many nights he would lean his chair back between the two and balance on the back legs. And, many times he tipped over, which made us laugh hysterically. They were so close that I could lift myself up and swing between the counter and washer. We did laundry almost every day and had about 6 lines for clothes to dry on at one point, which is why today I have no love for line dried clothes. 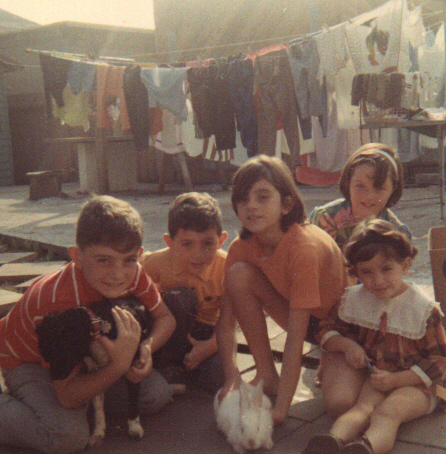 This is me (on the right) and my siblings ca 1968. You can see some of the laundry in the background. This was before we had to expand lines to between the garage and house. One thing I remember is the floor was made up of black tile with yellow and maroon flicks in it, very early 1960s. And, it was hard. I hit my head on that floor many times during pillow fights. It was unforgiving. I shared a bedroom with my two sisters. We had a bunk bed, then a plastic divider with a bed on the other side for my older sister. I don’t know how we did it but we got two dressers and two stereos in that room. There was a small closet and open storage over the closet which I used to imagine led to a magical place. I can remember that sometimes we’d take the bunk beds down. We’d jump from bed to bed. But, bunk beds could be fun too. You could make a fort with blankets and hide from your parents. I guess the place we hung out most was the living room. Two couches, two end tables, coffee table, a humongous TV, and the beautiful buffet cabinet that my Godfather built. That divided the kitchen and living room giving us the illusion that we had two separate rooms. My Mom was an amazing cook and we had home made meals almost every night. Well, even after my Mom went back to work when I was 5, we couldn’t afford to eat out often. I can still remember the wonderful smells from her stews and Thanksgiving dinners wafting through the house. This is me sitting on the coffee table with the Chesterfield behind me, ca 1965. 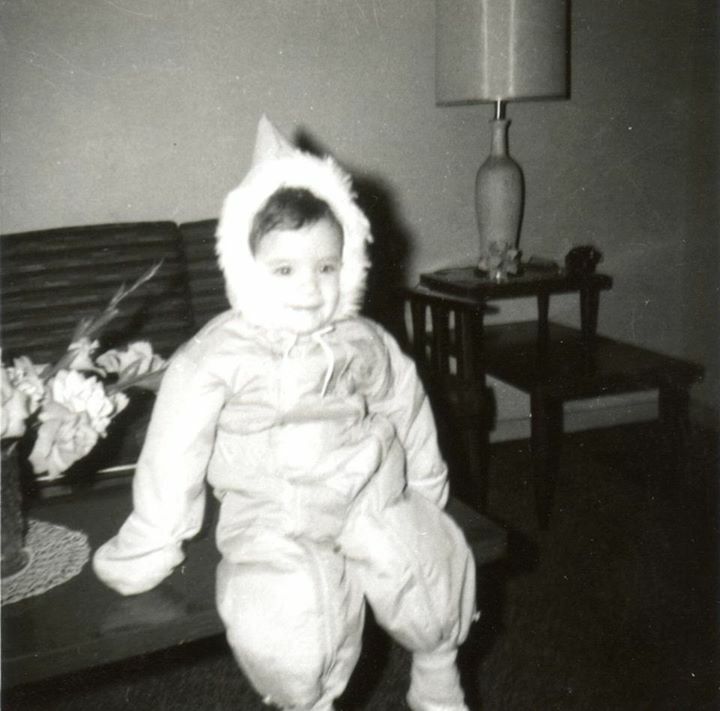 God only know what the heck I was doing with that snow suit on in the middle of the San Francisco Bay Area! I can remember how crowded that living room was when we got our Christmas Tree. We had no room to walk around the coffee table. The house went through various decorating phases. Chesterfields and plain wooden tables to the crush velvet green couches we got at the flea market with the tree trunk coffee table that our neighbor made. Big spikey wall clocks and large wooden spoon and fork behind the dinner table. We went from a small red kitchen set to a larger kitchen table with chairs and a long bench covered in velvet like fabric as our butts expanded and we needed more elbow room. Sitting next to my Mom on the bench was considered the penalty seat. No one wanted to be there. I can’t for the life of me imagine how we got all of us and all of our friends in that house. We often had friends over for dinner and I have no clue how we managed to even seat them. It was hard to find your own space in the crowded house. I think this is why the backyard was my favorite place on the property. Because it was the tract model and the garage was detached, we ended up with a larger yard than all the other houses. It was split in two with two reasonably good sized yards on each side. The front part was where laundry was done, so we didn’t play much there, except for in the play house my Dad built for us. We may not have had a lot of money, but our parents were resourceful. My Dad could build and fix almost anything. The other side of the yard was where the apricot trees were. We had a swing set and tetherball back there. My brother built a tree house in one of the apricot trees. The dirt piles created all sorts of imaginary places to play with hot wheels, forts, and anything else we had. Between the two yards was a long strip (probably not that long…LOL) I can remember being carted around in a wheel barrow, abandoned shopping cart, riding bikes, roller skating, and driving one of those pedal cars (no electric Power Wheels back then), up and down the yard. My Dad put us to work building wooden chairs. 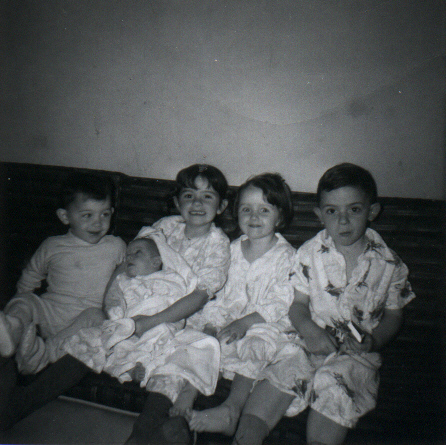 This was about 1966. This was before this half of the yard was cemented. You can see the large living room window and the backdoor that opened right into the kitchen. Gives you an idea of how cramped up we were inside. The living room was extended a few feet into the back yard. That gave us much more room to move around. It’s funny though. Whenever we had family get-togethers, we almost always crowded in the smaller old space. Old habits are hard to break. I haven’t been back to the house since I moved out 3 years ago. It’s not really the same anymore. It doesn’t look the same and I am sure it won’t feel the same. I sure have some great memories surrounding it and it’s been fun remembering that old, wonderful, lived in house.